With St. Patrick’s Day right around the corner, I found myself inspired to teach and help others create good luck and winning experiences in their lives. In this newsletter I will be giving you information that will help you create good luck, in addition to including a bonus of special vibrations at the bottom. I am working on a separate work related to transforming loss/losing into winning experiences so stay tuned for that information as well. The Secret Formula facebook page will contain that gift when it is available. So often, I hear people say, “I never win anything”, or “If it weren’t for bad luck, I’d have no luck at all”. These statements make me cringe because I know that the words we speak have a way of manifesting in our lives. I went into meditation recently to see what high guides and angels have to tell me about luck, and the information I obtained is in this newsletter, some of it a surprise to me! Negative energy: Like attracts like. If your dominant vibration is negative, you will create more negatives, bad luck included. The Secret Formula was designed to help you out of any negative state and into a consistent vibration that attracts good in your life. Using The Secret Formula iPhone app is the easiest way to use the formula. It is also available as a web app inside my Consciousness 101 program. Low expectations: If you expect to lose or have bad luck, you will. Setting your expectations low is a defense mechanism to keep you from being disappointed if you don’t win. Defense mechanisms may protect you from being disappointed, but they also block you from what you really want. The next section will tell you how to have high expectations. Fear: What I first saw when I asked about how we create bad luck, was an image of a big, black, scary spider. I got a little fearful just viewing the image in meditation, although I was a bit unsure what the message was. When I asked for clarification, I was shown an image of someone reaching high onto a wall (while they looked the other way) and squishing the spider. Still unsure, I asked for more clarification and received an image of a person with their hands on their face and hair sticking straight up. Haha, spirit has a sense of humor… this one was obvious and made me laugh. Since my brain doesn’t understand how fear creates bad luck, I wanted more verification and then saw a woman hiding behind a man, poking her head out. At this point, I still wanted to know specifically what fear does to the energy field. What I saw was a dulled solar plexus chakra and having gray energies drawn to it. Very enlightening. Fear of things like spiders actually creates bad luck. Overcome your fear: Rise above it… be bigger than what you fear! When I asked how we overcome fear, I was shown a person “growing” to the point of looking down on what was feared. Since we are already way bigger than spiders, this really should be easy ;-). I also think this is a message indicating that when we face and conquer our fears, we grow in the process. 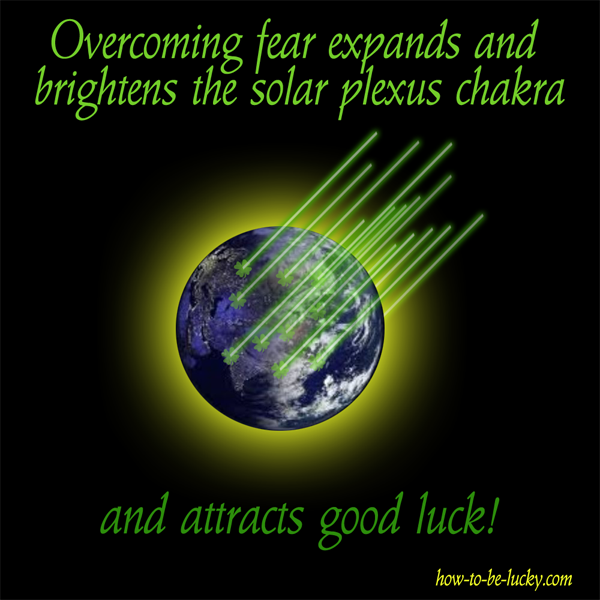 And, according to the image of the dulled solar plexus chakra when we experience fear, the personal power we exhibit when we rise above our fear, brightens and expands the solar plexus chakra and actually attracts good luck. Awesome. Use your imagination: Imagine being lucky and having good things happen in your life. If you’re choosing lottery numbers, while you’re doing so, think of all the things you’d do with the money. Imagine yourself winning. Really get into the feeling of winning and/or having what you would have if you won. Remember, you must maintain a consistent "lucky" vibration before you will start to see any physical manifestation. Doing it once for one minute probably won't make much of a difference if your dominant vibration attracts bad luck. Playing the lottery out of a desperate attempt to solve your problems is not the way to play the lottery. If you are in that state, it is best that you don’t put your money into this transaction. Expect to have what you want: There are a couple of ways of expecting something. One is with a negative energy behind it such as, “I did this for you, now I expect you to do something for me in return”. That’s not the way you want to expect something. Expect something the way an expectant mother expects her baby to be born at any time. She simply knows it’s going to happen. All the signs are there. She’s 8 ½ months along and as big as a house. THAT’S the right way to expect something to happen. When you think about what you want, imagine it’s nothing more than a bill coming in the mail. You expect to receive your bills, right? You can also expect anything else with that same vibration, and chances are, you will receive it. One image I received from spirit was that of a fisherman sitting in a boat on a lake with a fishing pole in his hand. He was very calm and relaxed and yet absolutely ready to reel in the “big one”! If you don’t know what these patterns are, I can help you find them. I can see the energy of past incidents that have got stuck in your energy field. Once they get stuck in your energy field, they attract more bad luck! When I learn what these patterns are, I also see where they are at in your aura/chakra system and clear them, heal them or transform them in a way that puts you in a “lucky” vibration. In addition, I can send energy to the solar plexus chakra to strengthen and brighten it. And until St. Patrick’s Day, I’m running a “Get Lucky” special! For lucky number $77.70, I will find out what patterns create bad luck for you and work to bring you information and healing that will create a vibration of good luck for you from here on out! That’s more than $47 off the regular price of a session like this! After you purchase this special "Get Lucky" session, you will receive a link to a form that will give me the personal information I need to connect to your energy field, calling on your personal guides and angels and do the work. Your session may not occur for a few days, but you will start to see a shift as soon as you submit the form. After I receive this information, I will schedule your session, do the work off-line, at a distance, and then email you the reading along with my treatment notes. One last thing... when I asked spirit what else I could share with the world to help bring good luck, I was shown and image similar to the one shown below. 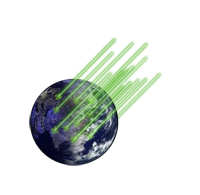 Forgive me, I’m an amateur at Photoshop, but what I saw were rays of green light shining either from, or down upon the earth. I asked how this can benefit my readers, and was shown, “Be open”. The image was of someone standing up, arms open and head back, and receiving these rays of good luck. So this is my gift to you. Open your arms, tilt your head back and receive these lucky vibrations!